, or Abydinus. This word, which signifies a native, or inhabitant of Abydos, is given by Eusebius, Cyril, and Syncellus, as the proper name of a Greek historian to whom some authors ascribe two works, “Assyriaca,” and “Chaldaica,” or the history of the Assyrians and Chaldeans; but it is probable that these are the titles of parts of the same work. The fragments quoted by Eusebius, in his “Praeparatio Evangelica,” St. Cyril, in his writings against Julian, and Syncellus, in his Chronography, have been collected and commented on by Scaliger, in his Thesaurus, and in his “Emendatio Temporum.” But Scipio Tettius, a Neapolitan writer of the sixteenth century, in his Catalogue of scarce Manuscripts, quoted by Labbe, in his “Biblioth. Nov. libror. 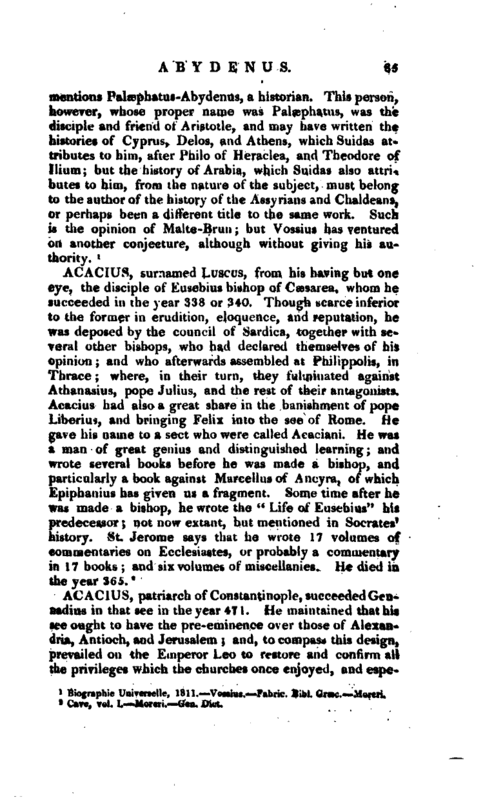 Manuscr.” p. 167, informs us, that the entire work of Abydenus exists in manuscript in a library in Italy. 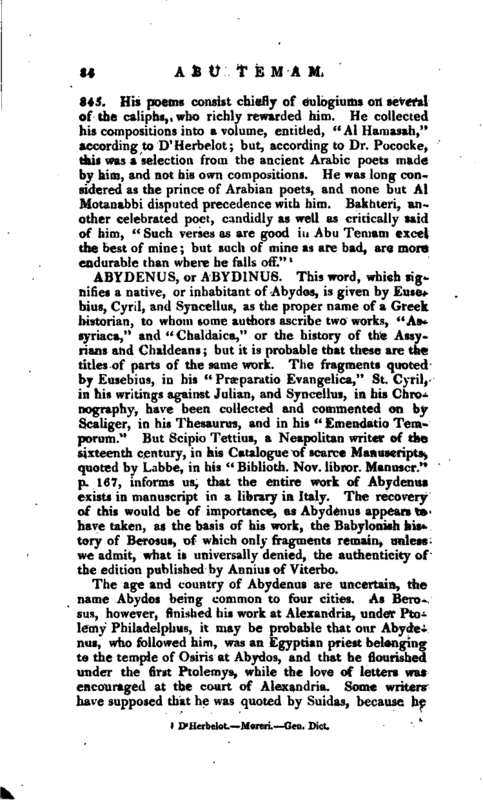 The recovery of this would be of importance, as Abydenus appears to have taken, as the basis of his work, the Babylonish history of Berosus, of which only fragments remain, unless we admit, what is universally denied, the authenticity of the edition published by Annius of Viterbo. Biographie Universelle, 1811.—Vossius.—Fabric. Bibl. Græc.—Moreri.